✔ Provides essential EPA, DHA & ALA. Formulated to deliver fish, flaxseed and sunflower oils. 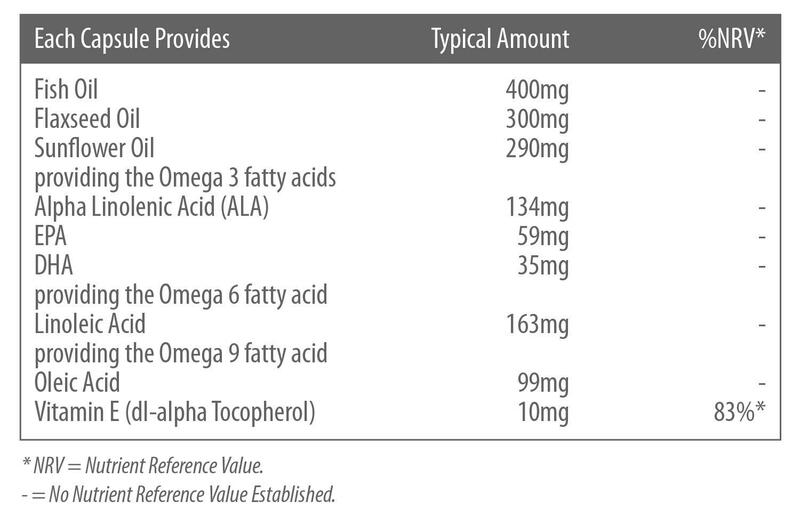 Fish Oil & Flaxseed Oil contain the important Omega-3 fatty acids EPA, DHA & ALA. DHA contributes to the maintenance of normal brain function and vision. When combined, EPA and DHA contribute to the normal function of the heart. ALA contributes to the maintenance of normal blood cholesterol levels, when a daily intake of 2g is consumed. Also contains Vitamin E contributes to the protection of cells from oxidative stress. Directions for use: Adults and children over 12 years: Swallow one capsule daily, with food. Do not exceed the stated daily intake. Ingredients: Fish Oil , Flaxseed Oil, Sunflower Seed Oil, Gelatin, Glycerine. Important: Food supplements should not be used as a substitute for a varied diet and healthy lifestyle. Store in a cool, dry place out of sight and reach of children.